Omnisend is a marketing and email automation software designed for businesses running ecommerce and online stores. Connecting Omnisend to your Fomo account takes a few seconds, and requires no coding experience. Journey to Omnisend and click on 'My account' in the top-right dropdown menu. From there go to your Integration & API settings and click on API Keys. Create a new API key and name it Fomo. 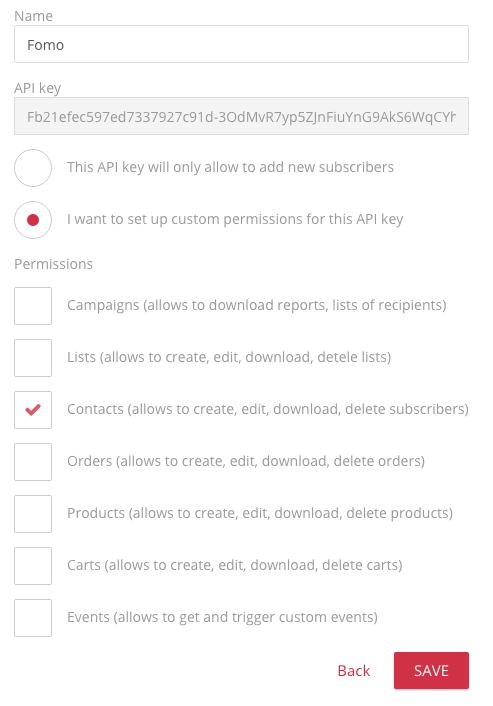 Edit the key by clicking 'I want to set up custom permission for this API key'. Check on the 'Contacts' box. This lets Fomo know when you get new contacts. Hit save and head to Fomo. Inside Fomo, navigate to the Integrations tab and find Omnisend by scrolling down or inputting 'omnisend' in the instant search field. Click 'connect with Omnisend'. Copy/paste the api key into the resulting connect form. Click the green 'continue' button. Fomo will immediately import recent invitees from Omnisend. Going forward, new subscribers will also be imported automatically.